Back in the summer of 2012, New York Times writer/cartoonist Tim Kreider penned a provocative expose entitled “The Busy Trap”. In it, he lamented the ways in which “busyness” was infiltrating daily life in such a way as to impact collective psychology as well as shape the way in which decisions were made and not made. As he outlined his argument, Kreider suggested that we may be leading busy lives because we’re afraid to face ourselves. We may be leaning toward busyness because somehow, in our world, being busy makes us feel like we are good people. In the subsequent years since “The Busy Trap,” I have often found myself reflecting on Kreider’s premise while observing myself and those around me. It does seem to me that, at times, the claim of being “so busy” is a kind of humblebrag for being important or valuable or somehow having a purpose in life. While I am not here to judge those who might be truly overwhelmingly busy, what I will say is that I, quite frankly, would prefer to be not busy and I would suggest that being not busy provides a much stronger sense of meaning and purpose in my life than the converse. Now don’t get me wrong, my life is every bit as complicated and challenging as that of most middle-class Americans with jobs, kids, bills to pay, and more. I battle the urge to succumb to exhaustion and frustration quite regularly. However, I also make a daily attempt to escape the busy trap and I do that through running. Like others, I have spoken to many people who often say they are too busy to run, too overwhelmed to commit to regular exercise. For me, and I know I am not like everybody, I feel like I am too busy not to run. My daily run gives my life structure, balance, and control. While the slings and arrows of daily life always throw me curveballs, my run is consistent, it’s standard, it’s always there. As long as I make the time for it, even if it’s just 20 or 30 minutes, that daily constitutional provides me with forced solitude and contemplation which in the process provides nurture and meaning to the rest of my busy, and sometimes unstructured, life. Kreider’s ultimate thesis in “The Busy Trap” is his assertion that “Life is too short to be busy.” And, of course, we’ve all heard the old adage that nobody ever said on their deathbed, “I wish I had spent more time at work.” But it can be difficult to combat the busy trap if we’re not paying attention. It can be all too easy to get swept up in the piles that life presents us with and upon getting swept up we can be easily distracted. Running can provide a way out of that distraction, if even for a few minutes a day, and, in so doing, can make us untrapped. 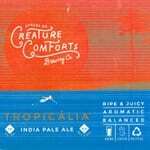 This week’s Beer of the Week comes from Georgia’s Creature Comforts Brewing Company. I recently had a chance to try to award winning Tropicália IPA and it did not disappoint. A slightly bitter version of the New England-style juice bomb, this balanced 6.6% IPA is delightfully balanced and highly drinkable. Do you ever find yourself in the busy trap? If so… and you want to get out, how do you do it? Do you find that running unbusies your life or the opposite? As much as running gives me fulfillment and direction, the things that give most meaning to my life often are those that prevent me from running, like my kid or my wife or my job or my friends. Great thoughts as always AJW! I am much more present in the rest of my life if I run. Interesting read AJW. The temptation to busy up our lives through dedication to being ‘in the loop’ at work, watching tv, or swiping through social media is certainly strong, if not overpowering for some. A quick look around in most public spaces will see a high proportion of people pulling out their phones and catching up on whatever each day. I wonder how many of the people who have no time for exercise find 20 – 30 minutes for these activities? I make time for running, and find that it provides space to my thoughts in the other things I do. Time well spent, I think I’d call it. To me, “busy” is a state of mind, not a state of being. An aspect of self-perception that we can change. Am I busy or am having a deeply rich day full or varied, fulfilling experiences of my own choosing? For me, the answer depends on how I perceive the tasks before me. Obligations, things I “must” do though I prefer them less to others add to my life’s busy-ness (or is it “business”?). So in some sense it becomes matter of priorities – as much as I would like to run today I have other obligations (or desires) that I prioritize over my run. If they are obligations I’d just as soon skirt (though I can’t) then I am “too busy” to run. On the other hand, if I see those other matters as positive, enriching experiences, then I’m not “too busy”, I’m too engrossed in what I am doing to break away. Recognizing that “busy” is a choice can be empowering. Life doesn’t have other plans for us that keeps us from running. Life happens, and we respond – sometimes without a run. But it’s a choice. Recognizing, understanding, and – most importantly – accepting that you have made that choice to prioritize other things over your run (or whatever) is the key to killing “busy” and seeing your priorities for what they are. Maybe then it’s just “otherwise busy” rather than “too busy”? I feel like it’s more positive and respectful of the other things you have going on, not all of which are chores. Ahh, it is a complicated idea — busyness and how it relates to running. A couple years ago, I lived on the road for an extended period of time, with my then-husband, two young kids and dog. We lived out of our truck. It was lovely. And for lots of days, it was the kids and dog and I, in the woods, with few needs or responsibilities. They were too young to weather constant trekking or to leave alone while I whipped out a few miles. And I struggled. With lack of busyness. It took me a long time to find peace with water filtering being the most productive part of my day. We did some rudimentary homeschooling, reading, playing in the stream if it was warm enough, exploring around the camp spot. We were not busy. We were un-wired, disconnected from the internet. All I had was time. And I never got to go running. And that was hard. Our society does place a lot of value on non-productivity. I spent a lot of time lost in thought about those values. And becoming OK with where we were, and what we were doing. Now I am back in the regular world, single parenting, working, homeschooling and everything else that entails. I’m busy as all get out, trying to keep my head above water. But, you know what? I’m running. “How much?” folks sometimes ask. “As much as I can.” It does make things busyer. It also gives me space. And sanity. It does take time away from people and things that I love. And I would be less busy without it. It also gives me a feeling of self-worth. And that is something that I think as runners, we get addicted to. True or not, it makes us feel worthy and, when we go a spell without running, we struggle to feel [strong, worthwhile, whatever]. It is a good challenge, I think, to take a break from running and try to find that feeling, that space from busyness, that peace, without the running crutch. Thank you for another enlightening article. Reading things like this is definitely worth our time :) and I love all the comments that followed too. Personally, I run early in the morning, to make the time. Although I sacrifice sleep as a result, I do my best to go to bed early, instead of staying up late watching TV or skimming newsfeeds. Running is one of my priorities and to fit it in (and make sure nothing else gets in the way) I run before the sun is up most days. The alarm is set 4:20am daily and then I simply get up and go, before my brain realizes what I am doing! And I am back home before anyone misses me! We also need to remember there are various seasons in life and we have to be adaptable and do the best we can. Running helps me focus and I’m more productive because of it, so I think I am using my time wisely. It’s a constant work in progress!